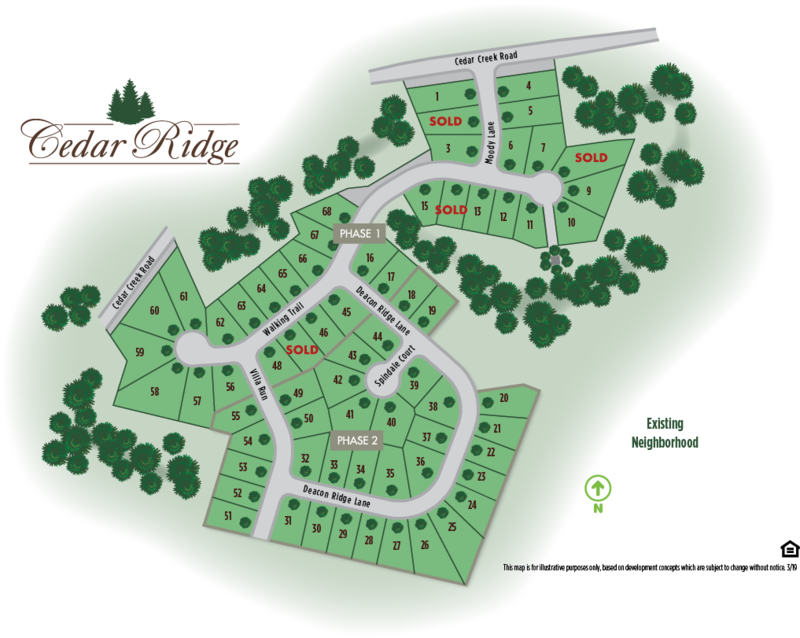 Cedar Ridge is an extraordinary new community of custom-built single-family homes. Consisting of 3 to 4 bedrooms and 2 to 3.5 bathrooms in ranch, 1.5-story, and 2-story homes of 1,900+ square feet, Cedar Ridge offers an exciting variety of styles to meet home owner needs. By bringing together a coalition of the Triangle’s top builders, we’ve combined affordable rural living with luxury custom details. All homes feature two car garages and an array of beautiful accents such as stone, shake accent siding, board and batten, and more! Our neighborhood appreciates its beautiful North Carolina countryside, featuring a mixture of meadow-style and wooded lots, open neighborhood spaces, and tree-lined Southern-style street planning. 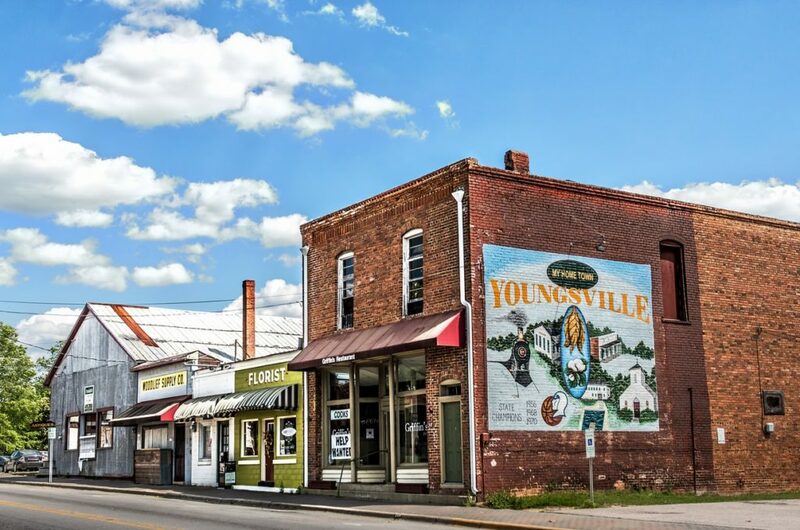 Youngsville is a town of just over 1,000 people, tucked away in the northern reaches of the bustling Triangle area of North Carolina. Like many small towns in our state, Youngsville owes its heritage to tobacco farming. Once catering to the nearby farmers, its charming downtown area now offers locally owned coffee shops, gift and novelty stores, and restaurants. New businesses inhabit the brick shells of the old guard, and many still feature the distinctive mural advertisements of their heyday. Make plans today to visit our friendly town to witness this charm in person! Youngsville residents are also a mere two and a half hours from the beautiful North Carolina coastline and three hours from the Appalachian mountains, offering an abundance of terrific day trips! 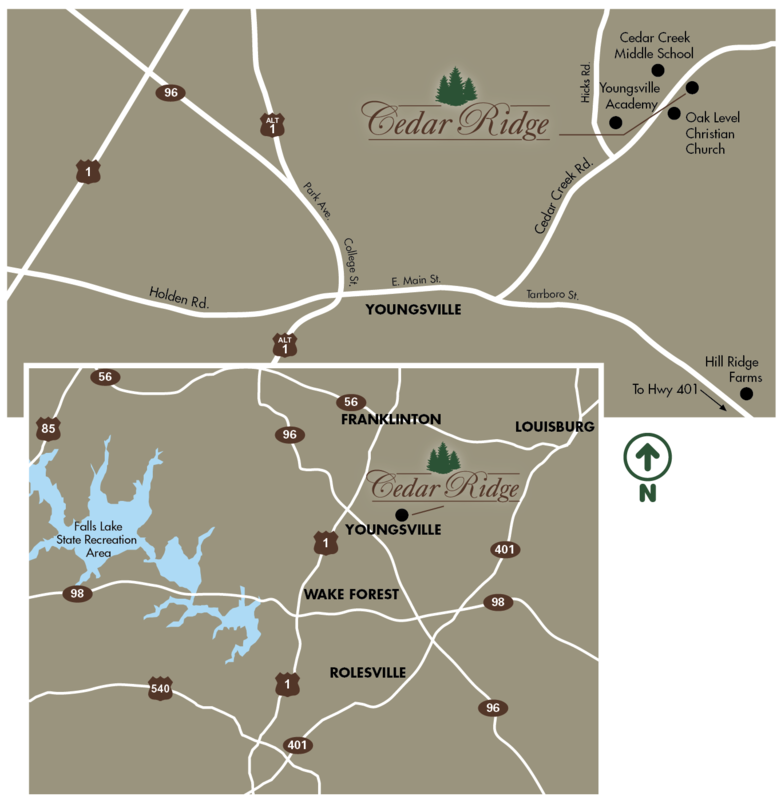 The location of Youngsville’s Cedar Ridge puts us on the Triangle’s northern edge, far enough from the city to enjoy serenity and close enough to not miss out! Our community offers easy access to schools, shopping, dining, and much more. Click on the tabs below to obtain more information on our local attractions.